Formula 1 pre-season testing reached its halfway point in Barcelona on Thursday evening and one thing is abundantly clear - Mercedes are once again in formidable shape. Rivals were awestruck by the amount of mileage the team were able to manage with a brand new car. Mercedes were determined to turn so many laps that they had to start splitting each day between drivers Lewis Hamilton and Nico Rosberg to avoid over-exerting them. "Amazing," said Williams technical chief Pat Symonds. Another senior figure put it into context: "800km is an entire grand prix weekend in one day." Not everyone was charitable, though. "It looks like they're gearing up to take that car to Le Mans," said one rival. "It's admirable, but it's taking the Mickey a bit. You don't need to do that many miles." Perhaps not. But, at this stage of the preparations, as Hamilton put it: 'Mileage - that's the key. To try and get as much mileage as we can." Lewis Hamilton says his team's 2016 car is "incredible"
The world champion added: "It's incredible. And I've never seen anything like it. Just the strength of this car, it just keeps going and going and going. "To think we won the two world championships and going into a third year you would think it is so easy to lose focus, but everyone has done an even better job with delivering the whole package." The Mercedes did not produce any stand-out lap times, but then that was not in the programme. Others were left to do that. Nevertheless, Hamilton's team-mate Nico Rosberg made it clear they were not lacking for performance. "I'm paying attention, of course," said Rosberg, who described the car as "quick". "We have strategists and they're doing calculations already, so more or less we already know where we are, with a band of errors. "Would you like to know? Sorry, I'm not going to say!" Red Bull team principal Christian Horner called Mercedes "stand-out favourites" on the first day of the test. Nothing that happened over the next three days made it feel like that analysis needed to be revised. Ferrari's Sebastian Vettel left the test with the fastest time - a one minute 22.801 seconds lap set on the second day on the new ultra-soft tyre. Indeed, Ferrari were fastest on three of the four days. Vettel's time was two seconds quicker than Mercedes' best, set by Rosberg on the medium tyre, which Pirelli estimates to be in the region of 1.8-2.3 seconds slower than the ultra-soft around Barcelona. In isolation, that makes it appear as if Ferrari were pretty even with Mercedes, even if other teams were not as impressed by Vettel's time as you might expect at face value. Now, let's state before we get too far into this that it is notoriously difficult to draw firm conclusions from pre-season testing times, especially the headline fastest laps. That's because there are so many variables - fuel load, usage of the DRS overtaking aid, circuit conditions, engine mode, different tyres. The list is endless. But ex-Jordan, Jaguar and Stewart technical director Gary Anderson used to say that you could get a reasonable idea by looking at the fastest times set by each car and factoring in the tyre used and the fuel needed for the length of the run on which the time was set. In other words, you might not know the exact fuel load the car is carrying, but you know the minimum it must have. It might well be carrying more, but at least it probably gets you closer to the reality. So, for example, Vettel's best lap was set on a three-lap run; Rosberg's a 17-lap stint. Factor in that and the tyres, and you end up with figures that suggest the Mercedes is in the region of 0.5-0.6secs quicker than the Ferrari. About the same as last year, in other words. That raises the question of whether Vettel's lap went well, in terms of driving, tyre preparation and so on. I'm told that, surprisingly, the ultra-soft tyre lasted for the entire lap, despite Barcelona being far tougher on tyres than the tracks it was designed for. Does that mean Vettel went too carefully on the tyre and did not get the best out of it early in the lap? And was that a better or worse approach than heating it up more and potentially having it lose its edge by the last sector? We can't know. What we do know is that Vettel had a decent feeling on the lap. Whatever the intricacies of lap-time comparisons from the outside, the teams have much more data at hand and will already have a decent picture of where they stand. Ferrari, BBC Sport understands, feel they have definitely closed in on Mercedes - not to the extent of catching them, perhaps, but their information at this stage is that the gap is smaller than it was. Force India, Williams, Red Bull and Toro Rosso all appear to be in decent shape - and probably not a million miles away from where they were last year. Force India had a particularly good test, looking both fast and reliable, and the first indications are that Toro Rosso may well start the season ahead of their parent team - perhaps not surprisingly, given that they are now using a Ferrari engine and Red Bull have stuck with Renault. However, Renault does appear to have made significant progress with its engine over the winter. The word on the street is that it is as much as 50bhp more powerful. That's a very useful upgrade and would take Renault up to around the magic 900bhp figure. That's probably something like 50bhp short of where Mercedes will be, with Ferrari somewhere in between and probably closer to Mercedes' 950bhp than Renault's 900bhp. But it may even be close enough for a typically excellent Red Bull chassis to get in the mix at places like Monaco, Hungary and Singapore. That engine progress could also be partly responsible for a better-than-expected showing by the works Renault. Their expectations were very low heading into testing, after taking over only in December a Lotus team that have been starved of resource over the last two years. But the car ran well in testing, Kevin Magnussen setting the second fastest time on the final day, and trackside operations director Alan Permane said: "The design and manufacturing teams at Enstone have done an incredible job. The aero development work we have done has worked very well and the car is a good step up on last year's aerodynamically." The new US-based Haas team also impressed - with strong reliability and decent pace. They have huge advantages thanks to their close links with Ferrari but to perform so well at their first test bodes well. The week started reasonably well for McLaren-Honda, with Fernando Alonso and Jenson Button both able to do plenty of mileage on the first two days. Not only that, but McLaren appear to have made a step forward with what was already a pretty good chassis. Alonso and Button were both in the top-three fastest in the twisty final sector on the first two days. And Alonso went as far as to say: "I think the target of having the best car, the best chassis, is reachable and very possible by the European races, and motivation is very high." Alonso also said the latest Honda engine had more power and Button said the problem of hybrid energy deployment, which was very poor in 2015, had been pretty much fixed. But more power is not the same as enough power. Fixing the deployment will be a massive boost, especially in races. But the Honda is reputed to be as much as 100bhp down on the Mercedes - and seeing the McLaren rooted to the bottom of the speed-trap times suggests that's probably not far wrong. Later in the test, reliability deserted Honda, too, with Alonso's second day wrecked by engine problems. Honda has a new engine coming for the second test and it is expected to be a reasonably significant improvement. A lot of engine development is allowed during the season, but Honda needs to make the most of it if two great drivers are not to be wasted for a second year. What about the new rules? Mid-way through testing, a swingeing set of rule changes was announced, for both this year and next. 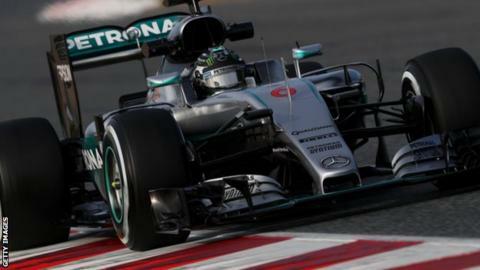 Plans to have faster cars for 2017 took a major step forward with the confirmation of bodywork dimensions, and BBC Sport revealed on Thursday that Pirelli is to be mandated to produce more durable tyres on which drivers can push flat-out. For this year, there will be a new elimination-style qualifying format. Officially, the teams have gone away to analyse it to make sure there are no unintended consequences, but senior sources say they expect it to go through pretty much untouched other than a few tweaks here and there. The drivers were equivocal about it - and Hamilton less keen than that. But the intent is clear. The FIA felt that grand prix weekends needed a bit of a shake-up, that the teams had got a bit too good at running everything smoothly. The idea is to throw in a bit of a wildcard, take the teams out of their comfort zones, induce some mistakes. Williams driver Felipe Massa predicted "chaos". Calmer heads said they thought that was unlikely. But the idea is to create a bit of unpredictability - and it looks like it will have the intended effect.